Turn PETA Loose - Oh dear. You're never going to believe who made that ad over there. I never thought the day would come when I'd advocate turning PETA loose on anybody. PETA, however, appears to be getting down to business when it comes to bunnies, and I'm aware they can be very effective when they're serious. This particular ad is aimed at the rabbit fur industry, but there's no reason PETA couldn't turn it's sites on the psychotic pet lover community. But they better send their usual band of frowning, shouting, ranting animal Nazis out to bring on the revolution. The cute bunnies next door will dilute the brand. 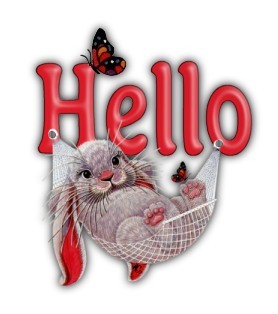 Hello Bunny - You may have noticed that Hello Kitty makes frequent appearances on the site. Well, I've got this friend see, and she's my very best friend, and she kinda likes the damn cat so I write her in whenever I can. Kinda like Lucy. Hello Kitty really does have some play here, though. That kitty is branding gold. Why not do the same for bunnies with a Hello Bunny anime? Bunny stalkers would be stopped cold. Or not. What does this woman remind you of? Aren't her features pinched tight? Her upper mandible dangling out over her lower? Her nose just a little too small for her otherwise ample face? She resembles that which she craves. In Portland she is known as the "Bunny Lady". Her neighbors have another suffix. The police have long since given up on conventional handles and just call her a whack job. 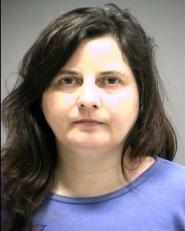 The whack job, aka Miriam Sakewitz, was arrested a week or so ago in her hotel room when a hotel staff member reported " . . . finding rabbits hopping around in her room." Hmmmmm . . . aren't rabbits supposed to hop? Isn't that one of the ways you can tell they're really rabbits? Didn't the most kickass rabbit of all, the Killer Rabbit on Monty Python, hop with a brutal, harrowing vengeance? Why haul the poor woman away for creating an environment where creatures are encouraged to behave naturally? I'll leave that battle for PETA to fight, though I suspect the balance of the story will create a difficult ethical conundrum for them. Well, there's quite a bit more to the story. The woman is a repeat offender, quickly working her way up PETA's ten most wanted list. Back in 2006, when she lived out in the sticks west of Portland, police raided her home and discovered 250 rabbits. That's not the creepy part. 100 were dead. It gets creepier. The dead ones were stacked in freezers and refrigerators. I suppose it would have been creepier still had she left them lying around to rot. But less creepy if she had buried them and altogether uncreepy if she had let them run around in the yard and be cute as bunnies are want to do. So authorities removed the rabbits from her clutches and sent them off to bunny foster care. But Miriam was not to be deterred. In 2007 she located the facility, conducted a counter-raid, and made off with the remaining live (and dead) rabbits. The woman gives a whole new meaning to the term "Dead or Alive". For this she was sentenced to five years probation and ordered not to go " . . . within 100 yards of a rabbit." This latter seems particularly ludicrous and a possible outcome of liberal marijuana use in the happy state of Oregon. Rabbits are quiet and prefer to remain so, making this a very difficult obligation with which to comply. So it's not surprising that Miriam was soon apprehended for violation of probation - a bunch of happy bunnies hopping around her hotel room. Those rabbits really were quiet. So here's the moral conundrum for PETA. Is it better to create an environment where the rabbits can live naturally (i.e., hopping around the hotel room) or is it better to pour your devotion on the creatures with suffocating intensity (i.e., carcasses in the freezer)? I can see the PETA engines humming red on that one. Here's what I'm wondering. What can a bunny do to protect itself?